AFS510 is a professional, compact 10 fingerprint scanning device for acquisition of single finger flats, rolls and four finger slaps. The FBI certified device provides superior image quality. The native segmentation and quality controll algorythm guarantees the best fingerprint result. The device is highly scalable: the finger sequence, the capture mode and further capture parameters can be configured by the user. The images can be saved in any industry standard format even in NIST structure. The forensic quality of the fingerprint scans makes them ideal for precise and reliable identification. AFS510 and the related software package (SDK) can be integrated easily into complete solutions. 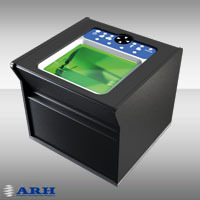 AFS510 can be configured to capture the fingerprints in various sequences (4+4+2; 2+2+2+2+2; etc.) Several captures are taken of each finger and the highest quality fingerprints are automatically chosen from the image sequence. The time-limit of scaning and the minimum quality of the fingerprint images can be defined. Ie: time:5 seconds, quality:700. The scanning finishes when the quality reaches the 700, or after the 5 seconds passes. The inteligent indicator system guides the user through the whole process. It indicates the sequence of capturing. During capture it shows how to place the fingers correctly and displays the fingerprint quality. The software checks the sequence of the hands and the proper vertical position. In case of missing, or redundant fingers a warning message is sent.